Many prospective parents wonder when they will know it’s the right time to stop trying for a biological child and begin the adoption process. This advice can help. Moms and dads describe the sometimes difficult journey to the family they were meant to have. Should you pursue adoption to build your family? Look through these overviews of the three main routes, including cost and requirements, to get a preliminary idea of how to adopt and determine the right adoption route for you. A general overview of the adoption process: how long it take, what you need to do at each step, and when you’ll incur expenses. How Much Will Adoption Cost? Answers to the most frequently asked questions about the cost of adoption. Before starting the adoption process, many prospective parents worry about birth family contact. Read up on the basics of open adoption to ease your fears. Wondering what a home study is? You’re not the only one. Here, find answers to your most frequently asked questions about preparing for and enduring your home study. Tools and worksheets to lead you through the process, from choosing your route to budgeting to interviewing and hiring an adoption attorney or signing on with an agency. Thousands of newborns are placed each year through independent adoption. You’ll need an experienced attorney to guide your way. | BY MARK T. MCDERMOTT, J.D. An adoption lawyer advises on deciding between independent and agency adoption, and on hiring the right professionals. | BY JANNA J. ANNEST, J.D. The foster care adoption process can be difficult for parents to understand. Two legal experts break it down, step-by-step, to help you figure out if fost/adopt is right for your family. | BY DENISE M. BIERLY, ESQ., AND BOBBIE L. RABUCK, ESQ. A surrogate can decide to keep the baby? Egg donors are only in it for the money? Read on for the realities that disprove these and other myths. You’ve spent endless energy and dollars in your longing to create a family without success. What’s next, you wonder: Do I have to give up my dream? An attorney explains what laws apply when you build your family through assisted reproduction. | BY PETER J. WIERNICKI, ESQ. Tools and worksheets to lead you through the process, from choosing your route to budgeting to interviewing and hiring an ART attorney or signing on with a clinic or program. Egg donation allows women without viable oocytes (eggs before maturation) to experience pregnancy and childbirth. Here’s what you should know. Embryo donation allows parents to carry a pregnancy and give birth to a child who will be theirs, though genetically unrelated. Here’s what you should know. Men are often shocked, and even ashamed, when they learn they will need to use a donor due to male infertility. They needn’t be. | BY MARGARET J. VEREB, M.D. Intended parents share in a gestational carrier’s pregnancy closely, and may be able to have a child genetically related to both parents. What can intended parents ask for and what are the boundaries of the relationship with the woman who will be carrying your baby for nine months? | BY MERYL B. ROSENBERG, ESQ. 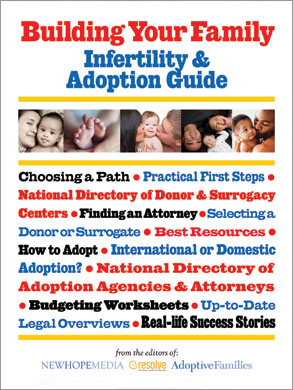 Welcome to the Building Your Family: Infertility & Adoption Guide! These days, families are being created in more ways than ever—including cutting-edge medical technology as well as domestic and international adoption. How do you determine your path to parenthood? In the articles linked from this page, we demystify your alternatives, point out key considerations, and help you plan your next steps to make your dream of family a reality. We are so grateful to RESOLVE: The National Infertility Association for sharing some of the assisted reproductive technology (ART) content you’ll find in this Guide. After a long struggle with infertility, subsequent family-building decisions can be draining. In “The Emotions Raised by ART,” read how other families felt at this stage. We think you’ll discover that you’re not alone. “The Reluctant Spouse” details how a parent overcame his fears about adoption. Adoption can be daunting to navigate. “What Kind of Adoption Is Right for You?” can help you figure out whether U.S. infant adoption, international adoption, or foster care adoption is the best fit, while the “Adoption Timeline” can help you manage the process. The listings of adoption attorneys and adoption agencies can help put you in contact with the right professionals for your adoption team. Join us as a member of our community site, AdoptiveFamiliesCircle, to ask questions and find support during the wait, and to share family photos and parenting experiences after you adopt. Assisted Reproductive Technology is a promising avenue that is also legally and medically complicated and chock-full of acronyms. The “Considering ART” section gives an overview of several common procedures. Our overview charts on donor egg, donor embryo, donor sperm, and gestational surrogacy can help you evaluate your alternatives and know what to expect. If you’re ready to move forward, our Adoption & Infertility Directory listings provide many points of contact. Don’t forget to explore the rest of this site for more personal stories, tools, and expanded listings. You can also read a free digital edition of the Guide. We hope Building Your Family will inform and encourage you. Your journey to family begins here!